I'll be the first to admit that I do not like to cook much. When I'm hungry, I'm hungry and want to eat NOW, not start an hour long session of washing, chopping, simmering and stirring. Also, after a long hard day, the last thing I feel like doing is standing on my feet on our hard tile floor. That's where GelPro intervenes to make the cooking experience a little easier. Now, GelPro won't actually prepare your family's dinner for you, but they will definitely help to make you more comfortable in the kitchen by relieving your tired, aching feet and back. I was fortunate enough to have the chance to review the brand new GelPro Plush Gel-Filled Anti-Fatigue Floor Mat in Flora Antique Spanish Oak. Read on to find out how the GelPro Plush compares to the original as well as whether it turned me into Julia Child...or at least made me want to stay in the kitchen! 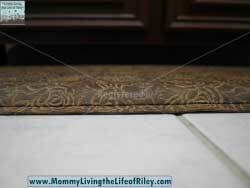 I reviewed the GelPro Plush Anti-Fatigue Floor Mat in Flora Antique Spanish Oak (20" x 36"), which retails for $144.95. GelPro Plush is the ultra-premium comfort floor specially engineered with a patented gel core reinforced with an extra layer of supportive foam for added luxury and therapeutic benefits. Plush mats are 50% thicker than standard GelPro mats. Each thick layer helps to alleviate the discomfort that can occur after extended time spent on hard surfaces, allowing you to stand for longer periods of time in ultimate comfort. The revolutionary Plush mat is available in the latest European designer patterns with a stain-resistant and easy-to-clean surface. The high-traction bottom backing is certified by the National Floor Safety Institute and has antimicrobial additives for added protection. The exceptionally supportive and stylish Plush mat is superior to other conventional mats on the market, making it the perfect addition to your designer kitchen. I have been a huge believer in GelPro Anti-Fatigue Floor Mats since my feet first felt their heavenly comfort almost a year ago. I couldn't believe that GelPro could find a way to make these mats any better, but they did! The GelPro Plush floor mats are absolutely divine and feel even better on tired, aching feet. As you can see from the pictures I took above, there's just no comparison between the new Plush mat and the original GelPro mat. I was also super surprised at how GelPro is only charging $20 more to upgrade to the new Plush mat. How is it possible to get 50% more mat for only $20 more money? If you are contemplating buying a GelPro mat for your hard tile or wood floors, then I wholeheartedly recommend upgrading to the new Plush series. I really liked how the Flora Antique Spanish Oak pattern I chose had a rustic, weathered look to it, which will fit in perfectly with our remodeled tile floors (once we finally get them put in)! The Flora pattern is also very beautiful for, from a distance, it looks like many intertwined and entangled lines, but as you grow closer to it, you realize that those lines actually form roses and their leaves. Although I chose the standard 20" x 36" size GelPro mat, I was really surprised at just how many different sizes were available. GelPro currently offers 3 standard size mats in the Plush line, 4 standard size mats in the original line along with 8 designer sizes. With that kind of variety, you could choose the EXACT size that would work best for the area you need covered. There are also a myriad of different color and pattern choices too, which would suit every style of home decor. 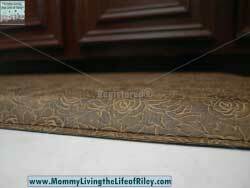 These mats are perfect for use in the kitchen, bathroom or any room where you normally do a lot of standing in one place. We currently have foam cushioned mats in our kitchen to stand on, but they don't seem to help my aching feet much. They always feel great at first, but then after a while, you start to sink into the foam and you don't really feel very comfortable any longer. With GelPro, it's different. The gel doesn't move out of the way, but rather conforms to your feet and still provides support. I honestly felt like I was standing on a plush piece of carpet while on this mat, and my feet and back didn't hurt, even while preparing a big meal! Standing in the kitchen used to bother me so badly, that I even have a mini-stool to sit on if I'm going to be in there a while. With the GelPro Plush anti-fatigue mat, I think I can put that kitchen stool away for good! Even Riley can frequently be seen standing in our kitchen, enjoying the comfort of the GelPro Plush! GelPro Plush Anti-Fatigue Floor Mats are made with such quality and superior design that your feet and back will be screaming, "Thank You!" If you stand in one place on a hard floor for an extended period of time, such as when cooking those delicious holiday dinners, then I believe a GelPro Plush Anti-Fatigue Floor Mat is an absolute must-have. Disclosure: I received the GelPro Plush Anti-Fatigue Floor Mat in Flora Antique Spanish Oak from GelPro in order to facilitate my review. No other compensation was received. This product review is based on my own personal experiences with this item and is completely honest and objective. I have been wanting one of these mats for a long time. Going to put on my wish list! I even entered a giveaway you had going back a while! Would love to win a Gel Pro for my kitchen as I am standing on a cement floor with a full length leg brace that I have to wear all the time since I am a polio survivor. I just went in to the kitchen to check the back of my mat and it says GelPro as well. I have both the regular and GelPro Plush and probably the easiest way to make sure you were sent the right one is to measure the thickness of it. When I measured from the base of the mat to where the mat begins to flatten out, I got around 1.25″. Hope this helps…have a great day!